MANGALURU: It is election season and even PUC result is fair game for politicians out to score political brownie points. Using the second PUCs results announced on Monday in which Dakshina Kannada district stood second, after Udupi which reclaimed the top spot from DK this year, DK MP Nalin Kumar Kateel took pot shots at Chief Minister H D Kumaraswamy for his alleged remarks casting aspersions on people of the coast. 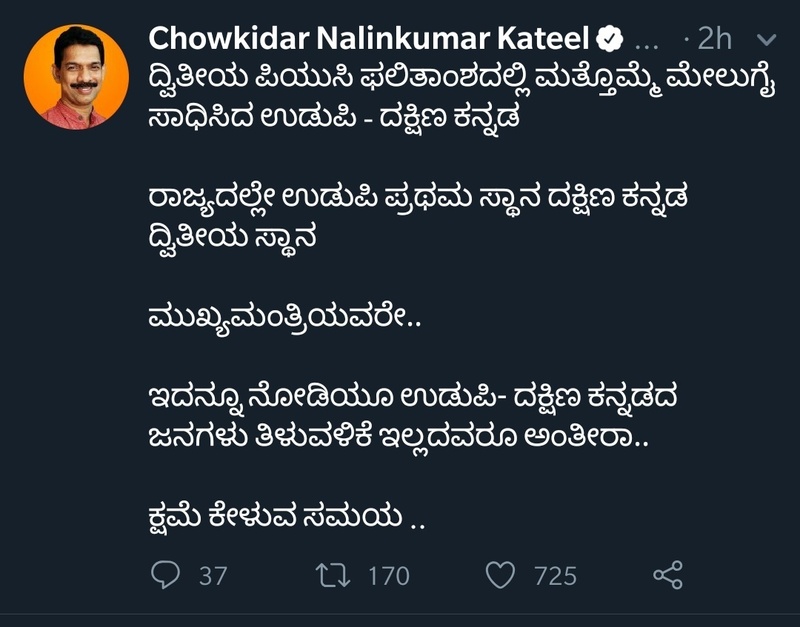 In a Tweet, Nalin observed that Udupi and Dakshina Kannada have yet again asserted their supremacy in the second PU examination with Udupi topping the list and DK coming in second. “Mukhyamantriavare, Iddannu Nodiyu Udupi-Dakshina Kannadada Janagala Tiluvalike Illadavaru Anthira? Kshame Keluva Samaya” (CMavere, after seeing this (PUC results), do you still think people of Udupi and DK do not have any knowledge. It is time to seek forgiveness), Nalin wondered. Incidentally, CM interacting with reporters at Sringeri on March 19 had said people of coastal Karnataka approach him or H D Revanna, PWD minister, also his brother for their myriad development needs, but never accept this reality. This created a flutter on the micro blogging site with coastal Twitteratti interpreting this as a slur on their integrity. Social media and Twitter went abuzz with messages that Kumaraswamy had called them dumb. The next day, in Mysuru, Kumaraswamy was forced to clarify and also Tweet his position, blaming the IT cell of the BJP for distorting his statement. Kumaraswamy had then stated that no one could blame the BJP and its IT cell in lying and spreading canards. “I never said people of coastal Karnataka are dumb. They are role models in fact in education and their intellect… . The BJP is trying to mislead the public,” Kumaraswamy had noted.